The attack was over in seconds but the next few hours were a blur of intense activity. The ship had been hit by four 500lb bombs (of British manufacture!) but fortunately none had actually exploded due to them being incorrectly armed for the extremely low altitude from which they were dropped. 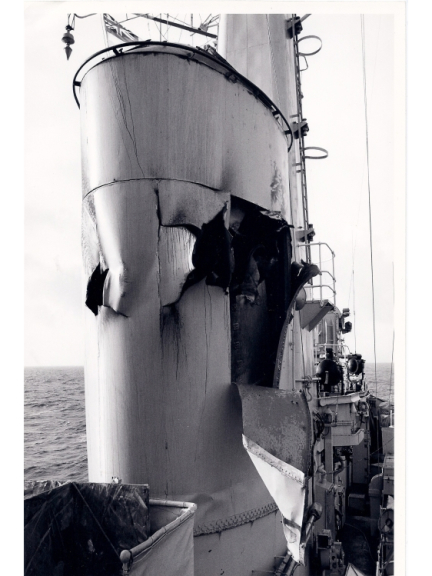 One bomb had hit a Depth Charge, which had been on the Flight deck, ready to be loaded onto the Helicopter and the Depth Charge had exploded, punching a hole in the deck and causing a fire in the Senior Rates accommodation below. A second and third bomb had hit further aft, smashing through the ships side and severely damaging the Mortar Handling room and the Anti-Submarine Mortars, part of our main armament. Two sailors were in the Mortar Handling room as the bomb came in one side and exited the other, they were so lucky not the be killed, never mind hurt, I should think they remember the moment vividly! The fourth bomb had smashed clean through the funnel, leaving a twisted mess of torn metal. We had been so lucky; even if just one of the bombs had gone off our story would have been a very different one. Five of our crew were injured badly enough to be airlifted to other ships for treatment. Ships and helicopters came to our assistance and quickly the fire was put out but it took a couple of days to get back to anything like normality. We all knew we had been very lucky! Wed 9:Spent the day cleaning up in San Carlos Water. Moved out to TEZ under cover of darkness. Morale good. The following day was spent cleaning up the mess; fire, smoke, water and structural damage had all taken its toll on the ship but we had to remain capable of fighting, even if only to defend ourselves but later that night under the cover of darkness we sailed out of San Carlos for the last time and headed out to the Main Group and the support ships for a bit of TLC!